The wind was calm and a hazy sun was out for the first day of the 2013 kayak fishing season but the fish did not seem to get the message. The water was in the mid fifties, warmer than expected and the setup looked perfect for smallmouth bass. Threw everything in the tackle box at them, including plenty of proven winners, but we only got a couple half hearted nibbles and that was all we had to show for eight hours of fishing. 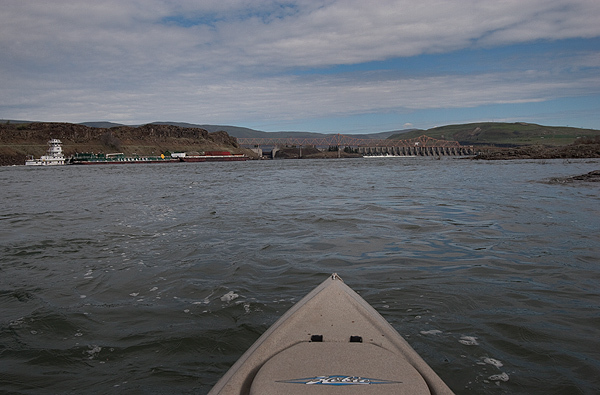 It’s still great to be back on the water and I got this cool photo of a tugboat pushing three barges into The Dalles Lock to get past The Dalles Dam that you can see in the distance behind The Dalles Bridge. One more thing. 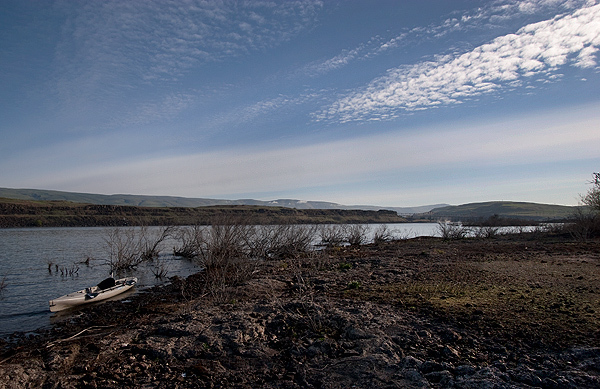 I was getting ready to launch my kayak in The Dalles when an Oregon State Trooper stopped by to check on my safety gear, which is now required by Oregon State law, and an Aquatic Invasive Species Prevention Permit, which I did not have. You have to have a PFD and a whistle to operate a non motorized watercraft in Oregon waters, that includes stand up paddleboards. That’s gonna be a big hit this summer. Make sure you have all your licenses and permits in order. I thought I had all the permits I needed, I was one short. The trooper was cool about it, he gave me a whistle and let me slide on the Invasive Species Permit, which I purchased when I got home.